This is one of those fabulously easy recipes that will leave everyone raving. 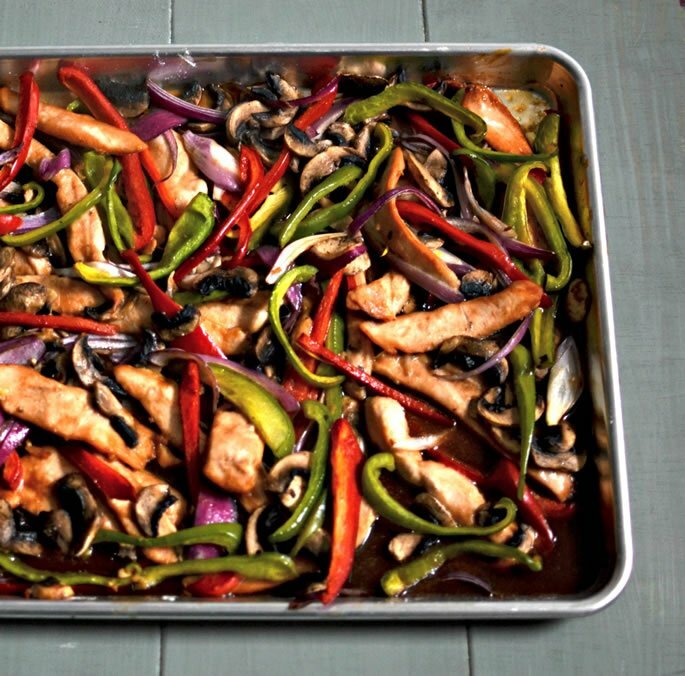 The chicken is velvety soft and flavorful, and the vegetables are cooked through but not soggy. 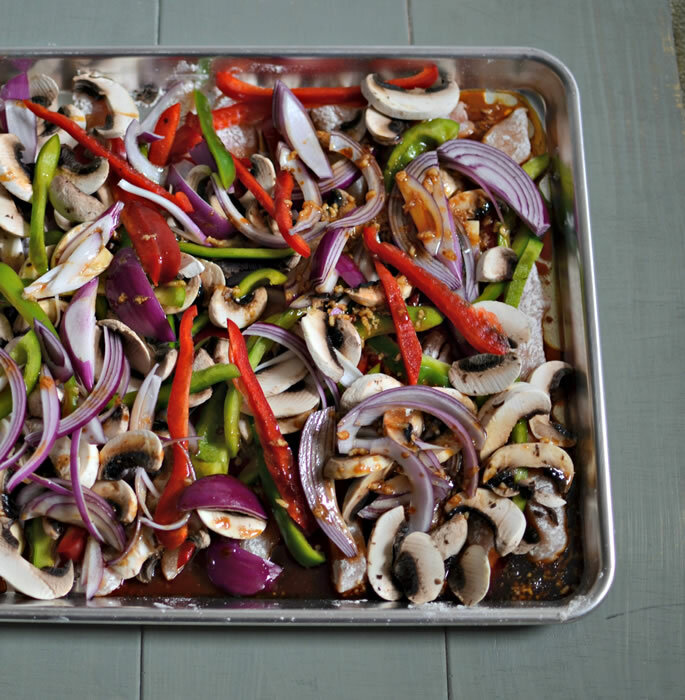 You can easily prepare it in the morning and just stick it in the oven 30 minutes before dinner. No babysitting or stove time required. Is it authentic Chinese? Nope. It’s American-style Chinese. But it’s also a whole lot less labor-intensive! Spread the veggies over the chicken. Mix the sauce in a small bowl and pour it over the chicken and veggies. Cover and bake for 20 minutes. Uncover and bake 10 more minutes. Mix and serve over rice or quinoa, or your preferred grain. You can also mix it with spaghetti like a lo mein. Cut the chicken into strips. 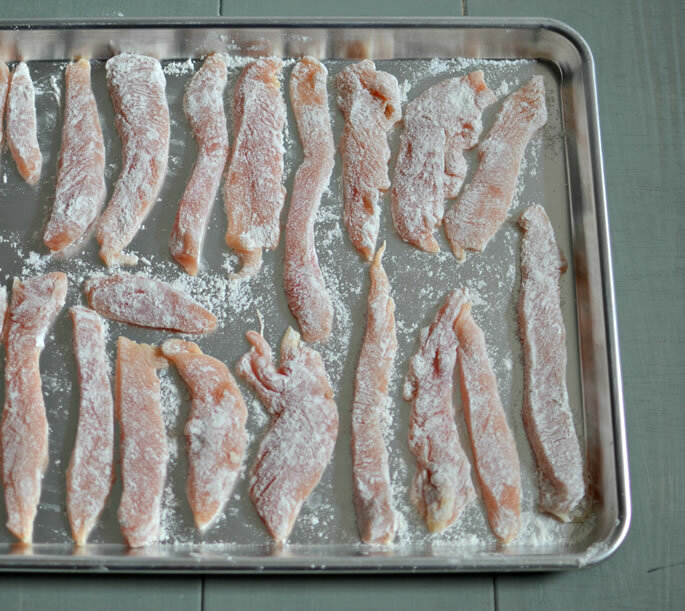 Dip each strip in flour and place on a cookie sheet. 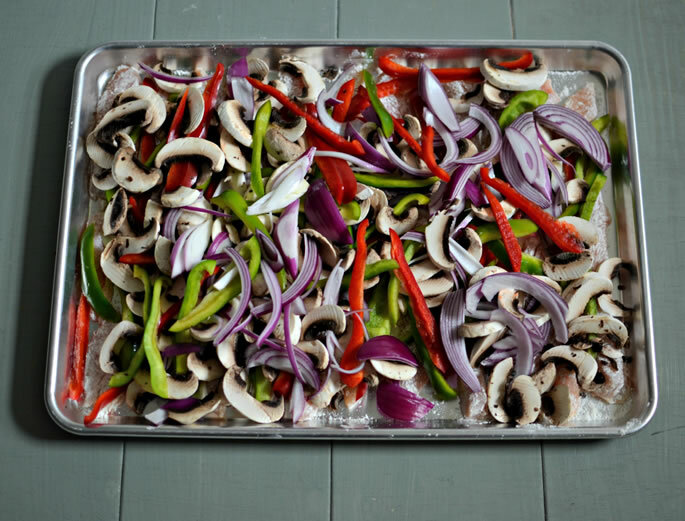 Cut the peppers into strips, the purple onion into thin half or quarter rounds, and the mushrooms into slices. Spread the vegetables over the chicken. In a small bowl, mix the oil, soy sauce, brown sugar, water and crushed garlic, and pour over the chicken and vegetables. Do not mix. 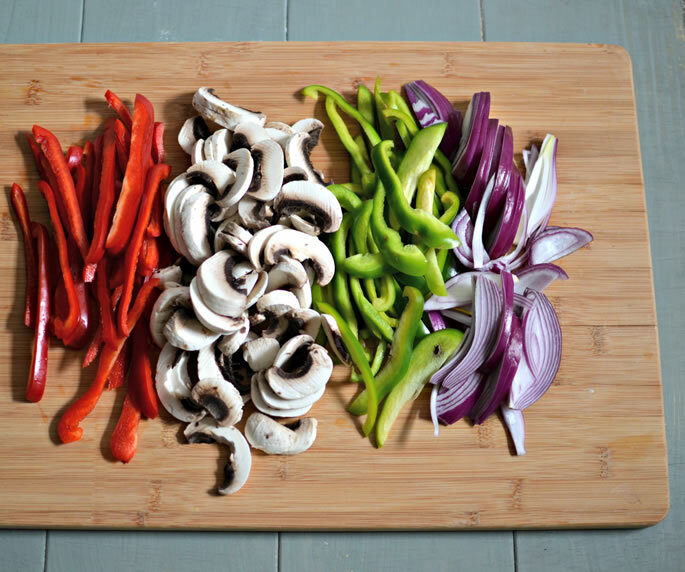 Mix and serve. Goes well over rice or quinoa, or mixed with spaghetti. So glad you are enjoying! Thanks for letting me know. I think corn starch or potato starch might be good alternatives to the flour. I don't like to freeze cooked chicken in general. I don't like the way it tastes when it's reheated. But if you are ok with it, there's no reason not to freeze this particular recipe. I take medicine orally for Diabetes, high cholesterol, high blood pressure. How can I alter this recipe suitably please? I tried this recipe for my family this evening. Everyone loved it. It's easy and will become one of my go to recipes. Thanks.